Born October 18, 1948 in Findlay, Ohio. Jonathan Curtis Marlatt has two active bands in the metro area: Brothers Curtis and Curtis & the Kicks. He also plays semi-regularly with his original Curtis & the Kicks Band from Louisville, Kentucky. Curtis is a guitarist and a vocalist. It is electric percussion drums, and a mandolin. Curtis enjoys playing Delta blues, Chicago blues, R&B, funk, rock and jazz. When I asked him to define funk, Curtis said it means "syncopated soul music" and another way of describing it would be "soulful, jazzy blues." And, Curtis defines blues as an expression of life's experiences from your heart. Curtis was born in Ohio, but his family moved to Louisville Kentucky when he was quite young. He is one of many middle kids (fourth born) in a family with 11 children (four boys and seven girls). Artistic expression and musical talent runs in the family. His younger brother, Charlie, plays bagpipes and played in the film "Gettysburg." And, his older brother, Reiss, is a jazz drummer and a painter. His sister, Amy, is a graphic designer. Initially, Curtis wanted to play baritone ukulele "just like his older brother's friend, Michael Rees. By age 11, he started teaching himself to play the Jewell T six-string acoustic guitar that his mother purchased for him through the catalog. It was during a folk festival and it was musicians such as Eddie "Son" House, Walter "Furry" Lewis, Leadbelly, Bukka White and Mississippi Fred McDowell that grabbed Curtis' attention and germinated his interest in blues music. Curtis also credits Burt Jansch (acoustic guitar) and Pentangle Band as influences on his music. By age 15, Marlatt had his first "garage rock band" named Organized Confusion. Immediately out of high school, Curtis' first two foci was college and swimming. During his freshman year in college, Curtis broke the Southeast Conference records while training for the Olympics. But, soon he found himself also embroiled with the music scene during his freshman year at the University of Kentucky. During this youthful time of his life, Curtis credits Charlie Day as his mentor and he played in Charlie's band, Stonehedge, as rhythm guitarist. Stonehedge had the honor of fronting bands such as Janis Joplin, Grateful Dead, Doors, Steppenwolf, Steve Miller Band, and Blue Cheer. 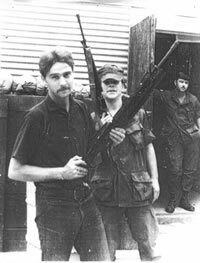 His time at the University of Kentucky and with Stonehedge, however, was short-lived: by the late 60's, Curtis found himself in Vietnam. For about three years, while in Vietnam, Curtis continued to play music with Captain Zig Zag Band and he toured with Special Services. Marlatt received a Silver Commendation for his role in wiping out an enemy machine gun nest and that happened while the band was on their way to a gig. 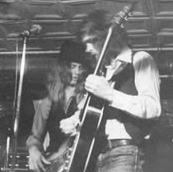 The Captain Zig Zag Blues Band had Bo Peep on bass and Jim Pokowski (formerly with Amboy Dukes) on drums. Upon his return from Vietnam Curtis played with the Hatfield Clan out of Kentucky from 1972-1975. Then it was off to Boston and Burklee College of Music, where he earned degrees in music arrangement/composition and audio engineering. While in Boston, Curtis played from 1977-1979 with a folk-rock band named Nancy Garrick and Room Service and with T. McGuiness Blues Band. By 1984 Curtis had formed his own band, back in Kentucky, named Curtis & the Kicks. The band, including band members Steve Erwin (bass), Shake (rhythm guitar & vocals), Curtis Marlatt (guitar & vocals) Gary Underwood (drums), and Rick DeBow (tenor sax and flute), is still together and semi-active. The title track of his 1990 CD Something's Wrong won a 1990 Louisville Area Songwriters Cooperative Award and led to his band competing in the International Blues Challenge in 1991, sponsored by the Indiana Blues Society. During this same time period, Curtis wrote a regular column for the Louisville Blues News. For a period of time, Marlatt worked in California (1993-1997) and there he had another band, using the same name, and consisting of members Curtis Marlatt (guitar & vocals), Gary Nieves (drums & percussion), Wayne Nelson (bass & vocals) and John "JB" Bart (keyboards). A job transfer landed Curtis in Minnesota in 1998. 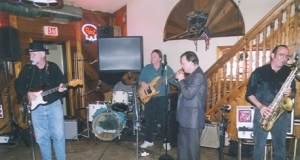 Curtis continues to play music regularly with Brothers Curtis, consisting of band members Curtis Blake (vocals & harp), Curtis Marlatt (vocals & guitar), Jerry Francis, (bass guitar), and Doug James (vocals & drums). This band has been hosting a weekly jam at the Triangle Bar for several years now. In addition playing the music, Curtis also teaches guitar at the American Guitar Boutique in St. Paul. Hosting a jam is a form of mentoring, but on a more individualized level, Curtis mentors Jason, his 17-year-old son, Jason. 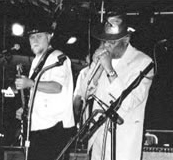 Some fond memories in Marlatt's music career include an eight-city tour that the Hatfield Clan did with Dr. John and the opportunity he had to open for Jr. Wells as a solo act. He remembers with fondness a comment Jr. Wells gave him about his playing, saying "your music took me straight to the back porch." And, during a Hatfield Clan rehearsal in Atlanta, Dr. John showed up and complimented them on the song they were playing. When asked what he enjoys most about the blues scene here, Curtis said he likes having the two major cities, Minneapolis & St. Paul, and a good metro wide fan base but he would like to see that base strengthened with more participation by the younger generations. He also mentioned that he considers this area a good funk music town or even a "funk mecca." He believes the funk scene here has benefited from home-grown talent including Jimmy Jam, Terry Lewis, and Prince. His advice to the young, aspiring blues musicians is to play creatively with feeling and don't try to mimic pop radio music. And, he added that if they should consider learning how to play bass guitar because there are always jobs to be had for the bass players. If someone finds they have a passion for the music and wants to be a serious musician, then honing skills is most important. When Marlatt isn't playing or listening to blues music, he enjoys listening to zydeco, Brazilian, West African juju, Cuban slack key, Hawaiian slack key, jazz, rock and Irish fiddle. His favorite music club outside Minnesota is the Slippery Noodle in Indianapolis. As a hobby, Curtis makes salt & pepper shakers. Other interests of Marlatt's include cooking, wine tasting, travel, basketball, and bird watching. Note - The Society creates Profile Books (with additional photos) for our events. We make those available for your viewing at various functions we hold each year.